That pile of scarves sitting in your closet is more than just a bunch of accessories. It’s a great way to make your little one smile. Not only do babies love the silky texture of scarves, but the colorful, bright patterns are sure to catch their eye. Try throwing them around so your baby can watch them twirl around in the air. Just like in the movies, babies love the sound of banging on some pots and pans. Grab a spoon or spatula, some pots or pans and let your little one rock out. OK, so we know the noise can be enough to cause a migraine, so just make sure that you set aside a short time period and stick to it. Safe and simple- babies love stacking plastic cups. Grab a variety of sizes and colors and set them out in front of your little one. The best part? They make for a fast cleanup! Grab some Tupperware with lids and show your baby how to snap them on. They’ll have a blast matching up the right ones. 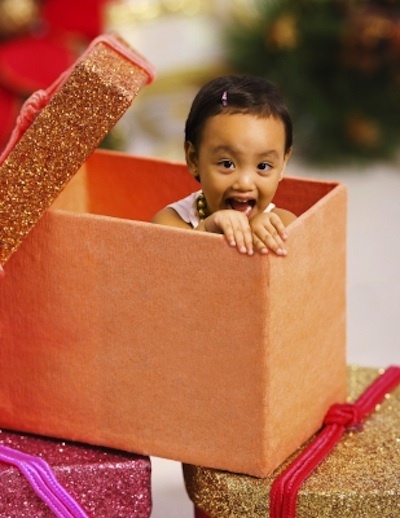 Grab some big cardboard boxes and make a tunnel for your baby to crawl around in. Let them hide under them and cruise through them.